All welcome to this from 10.30 a.m. onwards, either to do a spot of work or just to view the site and chat! The location is just west of the entrance to the Loop which is on Sherwood Street, Fallowfield. Here is a map. 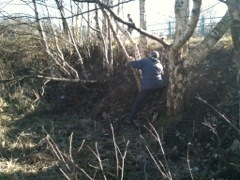 The main job is to do a preliminary clearance of the undergrowth on the proposed orchard site – brambles, saplings and other growth – and possibly to mark out where the planting holes might go. There is also some rubbish collection from the Sherwood Street entrance to do. Please bring tools relevant to these tasks if you can. Suggested tools are: saw, cutters, shears, spade, rake. Please also wear suitable shoes/boots and gloves. 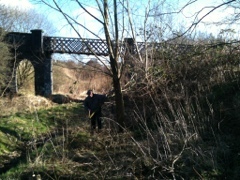 The orchard site is under the Wellington Road bridge and across the bridge over the stream immediately to the right.